A case of NIMBY(ism) or Hysteria? 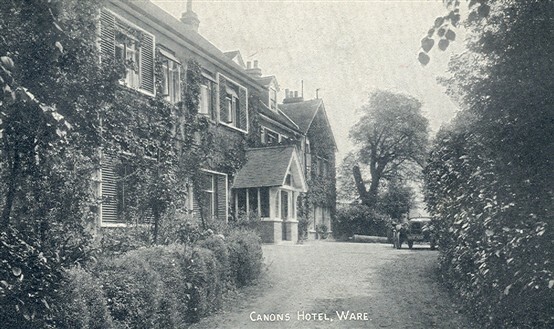 Being aware from previous articles concerning Canons, I was intrigued to stumble across items in Ware Urban District minutes which indicate that the ‘worthies’ of the District were not altogether enamoured at the possibility of Canons becoming a sanitorium halfway through the First World War. The saga is first reported in the Council minutes of 2nd August 1916, when a letter from a Mr Pickering was read, which strongly protested against the use of Canons as a tuberculosis hospital/sanatorium. The grounds for objection offered were “inappropriate position, depreciation of the value of other properties, and affecting the health of inhabitants” (of the Town one assumes) Similarly, it was reported that Mr AG Sandeman of Presdales had called and protested strongly on the grounds of “potential danger to health” and that it would “greatly depreciate property in the Town”. The clarion call was then taken up by the Members of the Council who UNANIMOUSLY RESOLVED that the Council “protest against the establishment of a hospital of this description in the Town as being likely to DEPRECIATE THE VALUE OF PROPERTY and to cause a RISK OF INFECTION TO INHABITANTS. The resolution then went on to order that a PETITION be prepared for the signature of the inhabitants and be left in the COUNCIL CHAMBERS by those who wished to oppose the proposal and that PUBLIC NOTICE be given that the petition could be signed. At the Council Meeting dated 16th August the County Council’s letter of acknowledgement was reported. Debate regarding progress of signatures to the Petition ensued and it was resolved that NOTICES regarding the Petition would be distributed throughout the Town and that it would be open to “any Member of the Council to obtain signatures to the Petition AFTER OFFICE HOURS”. At the Council meeting dated 11th October a letter from Hertfordshire County Council was read which closed the matter. It stated that they had considered the Resolution dated 2nd August, and the Petition, but “matters had gone too far for the County Council to withdraw from the proposal”. It went on to assure that “the Urban District of Ware would not find the proposed Hospital for tuberculosis TO BE IN ANY WAY INJURIOUS TO THE INHABITANTS”. The lapse of circumspection by the elected worthies of the District Council, almost 100 years ago, in so blatently wrapping fears about property devaluation within ‘concerns’ over the health of the electorate, rings a little hollow when viewed today. One might be forgiven for, perhaps,wondering whether in this case the lines between civic duty and self interest had become slightly blurred (in the heat of the moment) particularly as, even in those days, it was well known that the spread of TB was mostly brought about by people forced to exist in close proximity in sub-standard living conditions. This page was added on 25/08/2013.